Copenhagenize.com - Bicycle Urbanism by Design: "Nutcase is putting cyclists' safety at risk"
"Nutcase is putting cyclists' safety at risk"
Of the two helmets that flopped, Etto immediately called back the helmets in question and offer refunds to consumers. Nutcase Helmets, on the other hand, refused to react to the results of the test. They replied that their helmets met the demands in "their own tests". The head of the consumer tests, Niels Ebbe Jacobsen, says, "Nutcase is putting cyclists' safety on the line when they choose to keep their helmets on the market. It could cost lives at the end of the day." The Etto helmets failed the safety test, which gave them a failed grade. The Nutcase helmet failed on the shock absorption test. Well, not the shock absorption tests in their own heads, just the ones by the Danish Consumer Council. Conveniently, the helmets allow free access to the ears, allowing you to stick your fingers in and sing loudly, "Lalalalala! I'm a princess! Lalalala, I'm raking in the profits!!!" Another example, while we're on the topic, of helmet manufacturers who happily ignore safety warnings in the name of cash is the Danish Yakkay helmet brand. We've covered that previously. Okay, with all this said, let's add some grains of salt. The Danish Consumer Council have little knowledge of helmets and their limitations. They merely look at the European Union standard, EN1078, and test the helmets to see if they meet the requirements. They don't even have a test facility themselves, instead outsourcing to a German facility. They do not question the fact that the EU standard is one of the weakest in the world or that the phelmet industry is involved in deciding the standards. Which is kind of like the tobacco industry sitting at the table when health warnings and smoking laws are decided upon. They don't question the fact that helmets are only tested for impact on the top of the helmet and not on the sides or front or back and that they don't protect against dangerous rotational injuries. All of this is perhaps more of an issue for The Danish Council of Ethics and similar councils abroad. "Though helmets are widely accepted as reducing the severity of head injuries, the issue of mandatory requirements for helmet use has been controversial for a long time. PROMISING, a research project commissioned by the European Union and coordinated by the SWOV Institute for Road Safety Research (2001), suggests that from the point of view of restrictiveness, even the official promotion of helmets may have negative consequences for bicycle use, and that to prevent helmets having a negative effect on the use of bicycles, the best approach is to leave the promotion of helmet wear to manufacturers and shopkeepers. " Then there is this article "How helmet promotion and laws affect cycle use" and our previous article by sociologist Dave Horton about Fear of Cycling and Helmet Promotion. In addition there is The Culture Fear relating to bicycle helmets. There are an awful lot of people in this fear game who don't have much knowledge about helmets. Most are foolish, lazy people who are not aware of the consequences of promoting sub-standard safety equipment that is only designed to protect a head from non-life threatening impacts, on the crown of the head, in solo accidents under 20 km/h and instead giving people (read: consumers with cash to spend) the impression that helmets will save their lives. Then there are those who profit from selling helmets. At least their relutance to address the facts is clear cut. It will affect profit. Doesn't make it right, but at least their intentions are clear. All of this is rather nonsensical when you consider that most helmets on the market don't do much more than line the pockets of companies. Whilst researching all this I stumbled across a Swedish company called MIPS. They have developed a new kind of helmet that has a thin layer of liquid between the two shell layers designed to reduce the intensity of rotational impacts. The outer shell rotates a bit upon impact. What's interesting about their website and their video, above, is that they're basically saying that existing helmets don't do much for you. Ever Lazer helmets call rotational injury The Absolute Enemy. A. Withdraw their faulty products from the market? B. Start producing and promoting motorist helmets instead? At least THAT will have a positive effect on promoting cycling and speed the journey to fewer car trips by scaring people out of cars, instead. 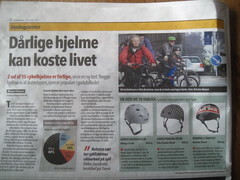 Two of the most sold bicycle helmets are not safe enough, a new test from the The Danish Consumer Council's magazine Tænk (Think) shows. The helmets from Etto and Nutcase are not good enough at absorbing shock and that increases the risk of serious injury. Etto is recalling the helmets in question but Nutcase refuses to respond. The helmet producer said to Tænk that the helmets pass their own tests. ”Nutcase is putting cyclists' safety at risk by keeping the helmets on the market. It could cost lives at the end of the day”, says Niels Ebbe Jacobsen, head of testing at Tænk. 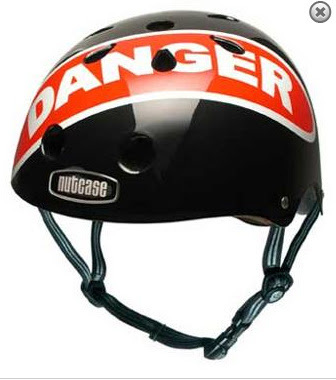 The helmets from Etto and Nutcase are popular skater-type helmets. In Tænk's test, skater-type helmets received lower marks compared to other styles because of reduced ventilation. Although many skater helmets like Mango X-ride did just as well as traditional bicycle helmets in tests.